Dive into a timeline covering the subjects of Clear and Present Danger. The timeline will expand as we travel through the history of free speech. 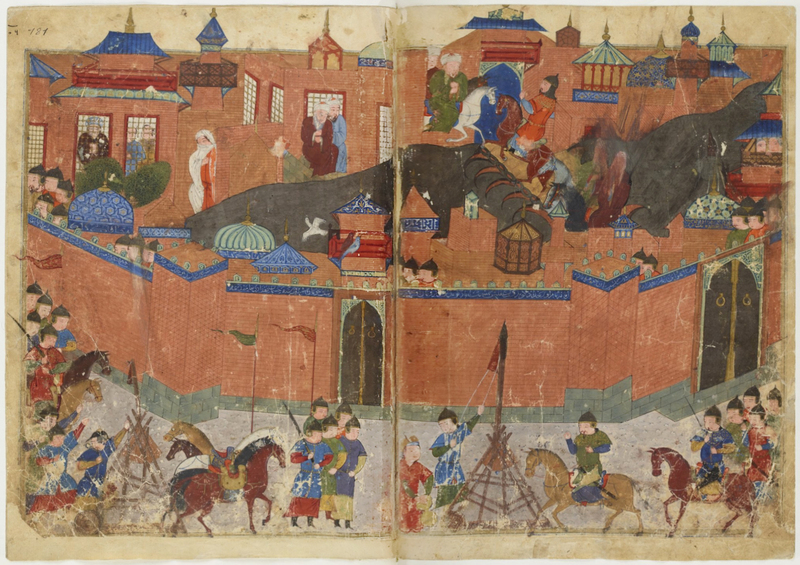 The Mongols conquer Baghdad in January 29, 1258. The event causes the downfall of the ʿAbbāsids and the end of the Islamic Golden Age. The Tigris is said to run black with scholars’ ink and red with their blood. So many books from Baghdad’s library are thrown into the river that a horse can walk across them. In episode VI, we get Medieval! Find out why the Middle Ages were as much a period of inquisition and persecution as reason and inquiry. Why was the famous medieval intellectual Pierre Abelard castrated, forced to burn his works, and condemned to silence by the church? How did the combination of Aristotelian philosophy and the development of universities institutionalize reason and science? What are the parallels between clashes over academic freedom in the 13th and 21st centuries? All this and much more in “Clear and Present Danger” – episode VI! In 800 on new years eve, Charlemagne is proclaimed Holy Roman Emperor by the pope. With his court in Aachen, he revives the Latin language and rescues ancient manuscripts from oblivion. But blasphemy is a capital crime, heretics are persecuted and heathens are converted by the sword. Around the turn of the millennium, new farming techniques are invented. Modern historians believe the weather is getting warmer and more stable too. The European population virtually explodes, either doubling or trebling in size between 1000 and 1300. New cities sprout up and the continent enters a period of social, intellectual and cultural transformation later known as the 12th century Renaissance. The multitalented theologian, philosopher and poet Pierre Abelard (1079-1142) is most famous for his love affair with Héloïse. It turns platonic when Abelard is castrated by Héloïse’s uncle. Abelard’s theology attract a fair amount of controversy too. In 1121, the synod in Soissons condemns the work Theologia for heresy and orders Abelard to burn it with his own hands. In 1141, his heretical propositions are condemned again. Abelard dies in 1142. Supposedly, his last words are “I don’t know”. 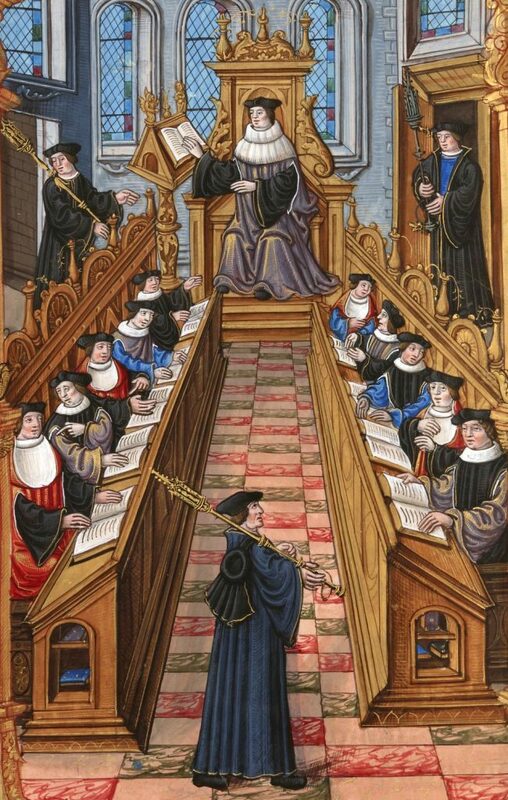 Europe’s first universities evolve in Paris and Bologna around 1200, when masters and students go together to form artisan guilds known as universitas magistrorum et scholarium. A few years later, the first English universities are born in Oxford and Cambridge. By 1300, there are 18 universities in Europe. By 1500, there are 70. With the rise of the university, masters of theology become the new heresy police. There are about 50 known cases of academically related trials in the thirteenth and fourteenth centuries. The first offender is Master Amalric of Bène. 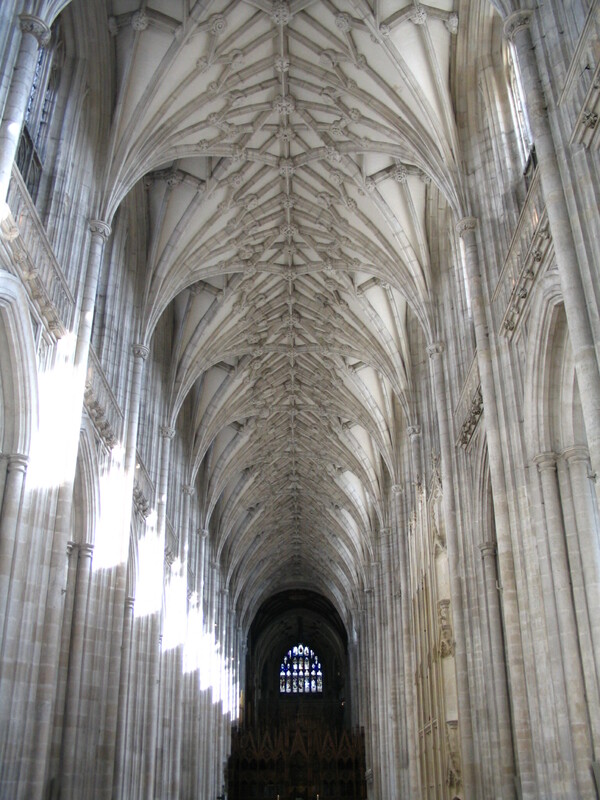 Around 1206, he is found guilty of false teaching for advocating pantheism. Four years later, he is excommunicated and his followers are burned at the stake outside the gates of Paris. However, the majority of cases do not convict persons – only books. The offenders are usually free to continue their careers when they recant and burn the problematic works. 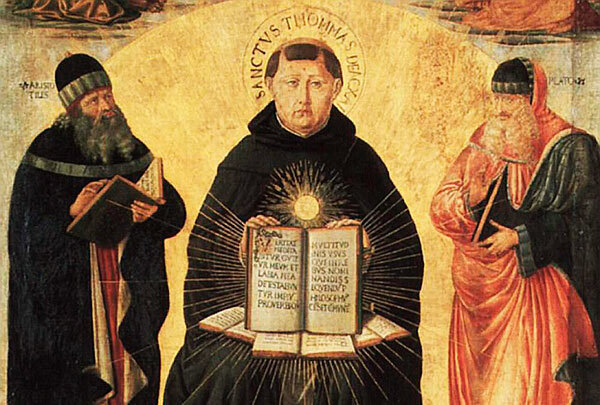 The Dominican friar Thomas Aquinas is one of the most influential thinkers in the 14th century. His greatest achievement is combining Christian doctrines with ancient philosophy. Most of his proofs for the existence of God build on aristotilean and platonic ideas. 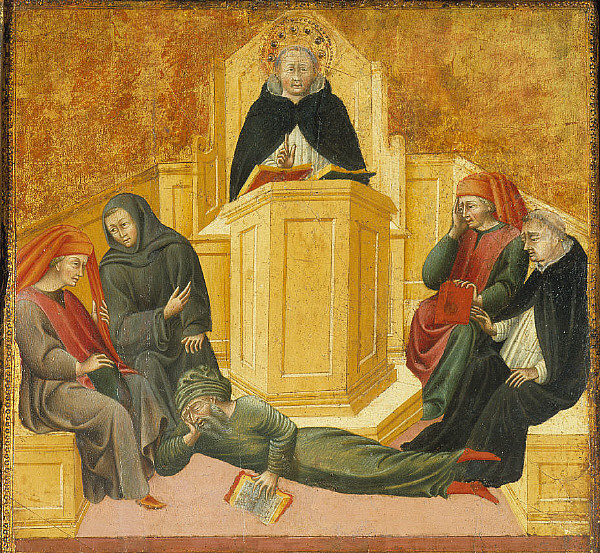 Giovanni di Paolo: St. Thomas Aquinas Confounding Averroës (1445-1450). Bishop Tempier mainly condemned the works of Aquinas and Averroës aka Ibn Rushd. In March 1277, the Parisian bishop Étienne Tempier issues a list of 219 forbidden propositions. The list includes the notion that “happiness is found in this life, and not in another”. The Archbishop of Canterbury soon back up Tempier in a double assault on heresy. Most of the condemned propositions come from the works of Aristotle or Aristotelian philosophers like Thomas Aquinas, Siger of Brabant, Ibn Rushd (Averoës) and Ibn Sina (Avicenna). 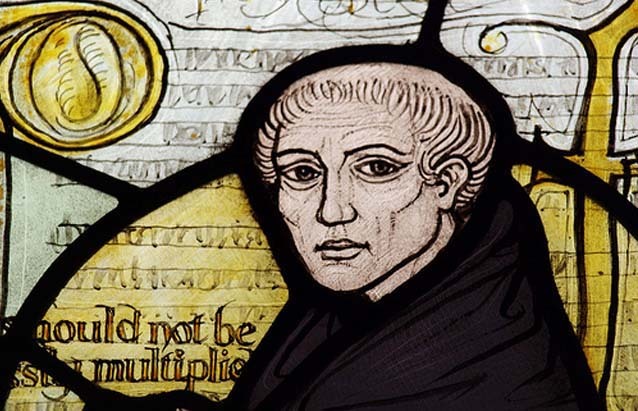 The friar and philosopher William of Ockham is best known for his razor: The problem-solving principle of going with the explanation based on fewest assumptions. In 1339 and 1340, two statutes ban Ockham’s ideas from the University of Paris’ faculty of arts. 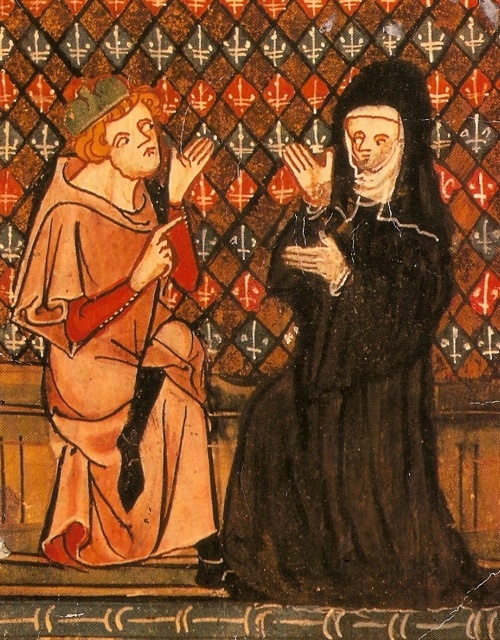 The philosopher Nicholas of Autrecourt – also known as the ‘Medieval Hume’ – is convicted of false teaching in 1346. He is sentenced to burn his works and stripped of his title as master of arts. We try to answer these questions — and more — in episode 8 of Clear and Present Danger: The Hounds of God. 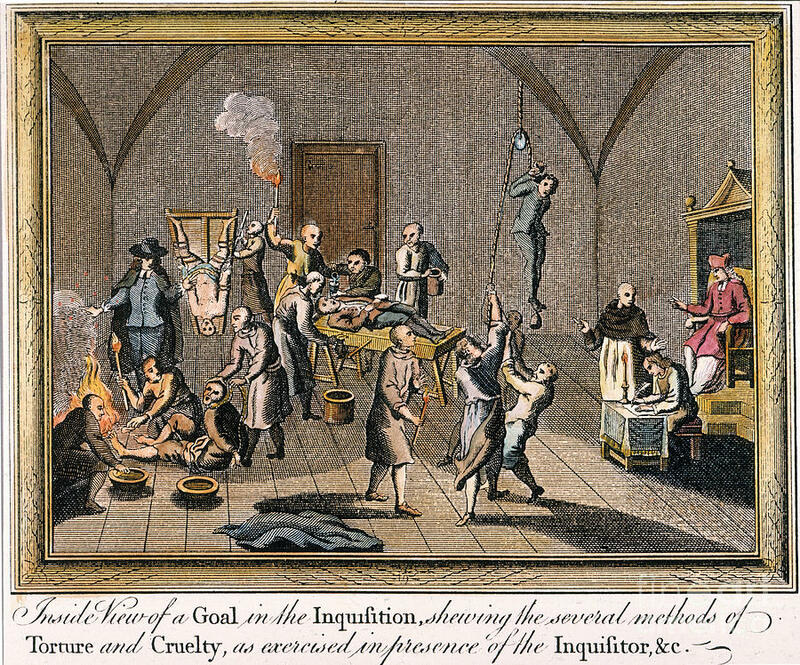 The term ‘Medieval Inquisition’ covers a series of inquisitions, spanning from the Episcopal Inquisition in 1184 to the Papal Inquisition in the 1230s. Pope Lucius III launches the Episcopal Inquisition in 1184 because of two growing groups of heretics: the Cathars and the Waldensians. Both are excommunicated, and the pope issues a bull instructing his bishops to comb their jurisdictions for heretics twice every year. 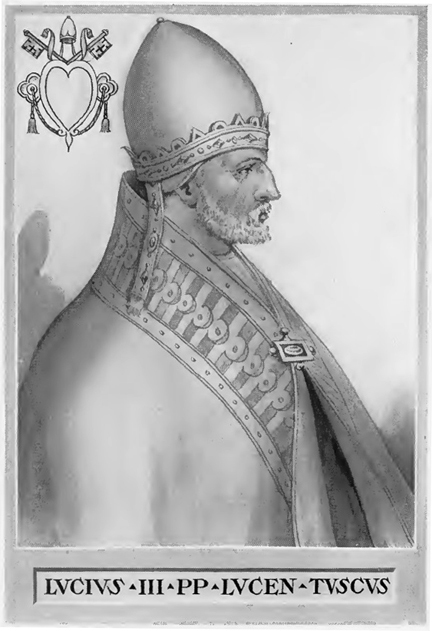 Lucius’ successor, Innocent III, steps up the inquisition in 1199 by making heresy equal to high treason. In 1208, the pope orders a crusade on the Cathars. Between 10-15,000 heretics are massacred in the town of Beziers. 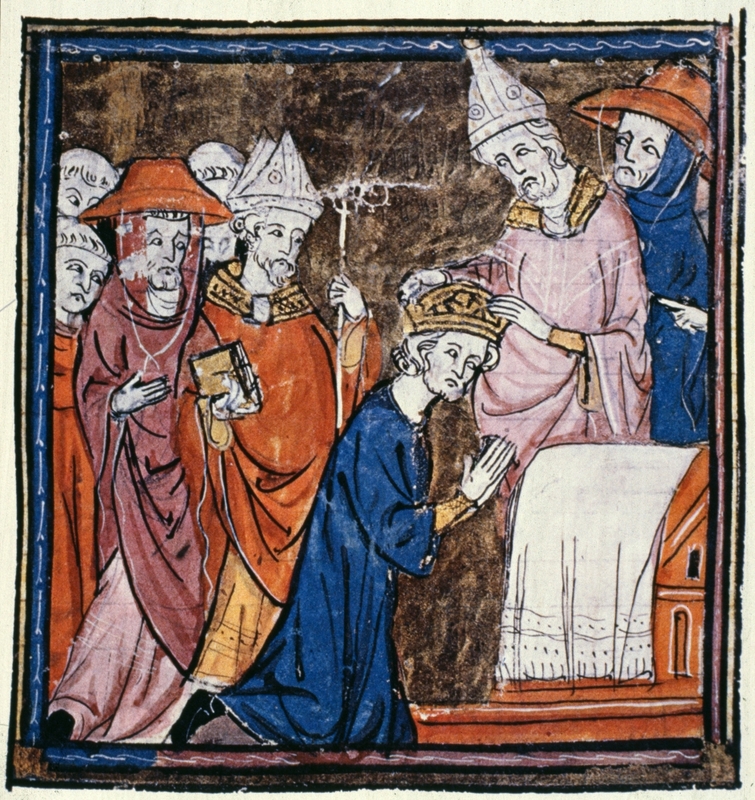 In 1231, Pope Gregory IX orders Dominicans in the German city Regensburg to “seek out diligently those who are heretics or are inflamed of heresy”. More people are burned to death in the following decade. 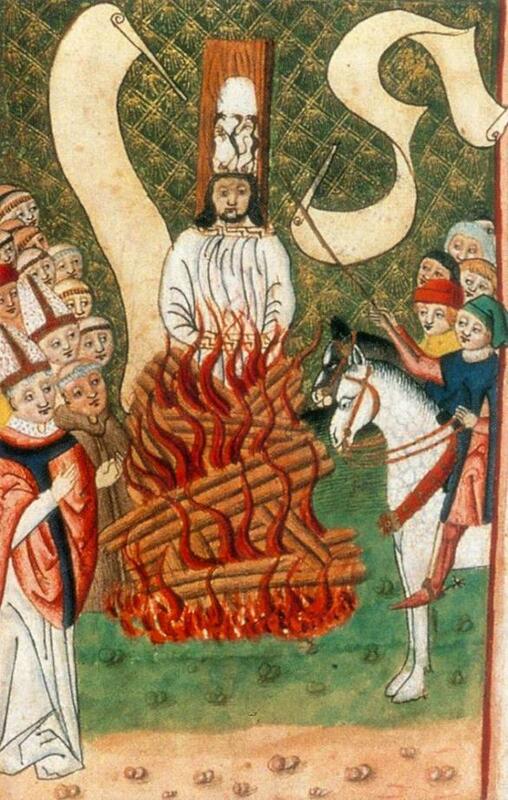 The Czech theologian Jan Hus is burned to death in Jena on July 6, 1415. The execution is a sign of the times to come. The number of religiously motivated executions grow rapidly in the 15th and 16th century. The Spanish Inquisition is launched in 1478 by “the Catholic monarchs” Fernando and Isabel. It is not abolished until 1834. 150,000 people are persecuted. Between 3-5,000 are executed. The goldsmith Johannes Gutenberg (c. 1400 – 1468) is credited as the inventor of printing with movable type. Together with another goldsmith, Johann Fust (c. 1400 – 1466), he sets up Europe’s first printing press in Mainz around 1448. Around 1454, they finish their first book: The Gutenberg or 42-line Bible. 400 years earlier, the Chinese inventor Pi Sheng experiments with printing with movable type. The world’s first book in movable type is printed in Korea in 1409. From Mainz, printing spreads to neighboring cities in the region. Then it travles with the Rhine to Italy, France, Switzerland and the Low Countries. Before the end of the 15th century, printing offices open in Bohemia, Poland, England, Spain, Portugal, Denmark and Sweden. From around 19 cities in 1470, 255 European cities have a printing press in 1500. 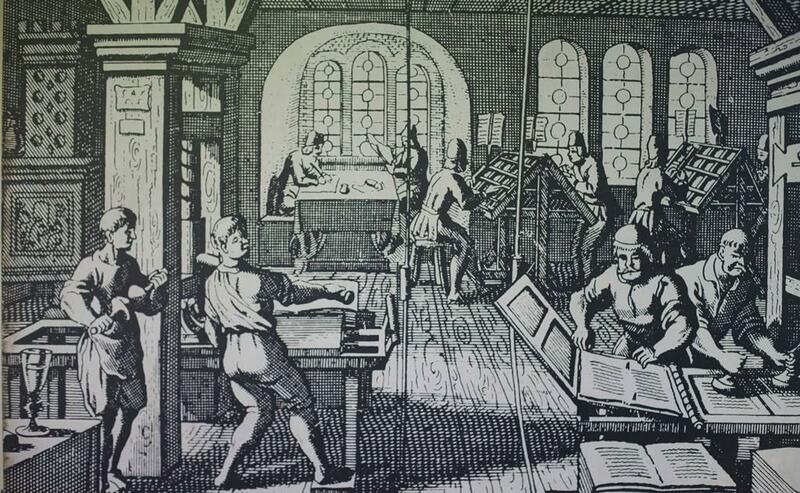 In the 16th century, printing takes on the world. The Portuguese set up printing presses in their colonies in Goa, Macao and Nagasaki. The Spanish conquistadors set up the first American printing press in Mexico in 1539. The first Russian printing press is set up in the 1560s, and the first Arabic type printing press in the Ottoman Empire is set up in the 1720s. Pope Innocent VIII issues the bull Inter multiplices: The first ever regulation of the printing press. The bull addresses the whole Christianity, but is only effective in Cologne, where all printers are monitored by the university and the archbishop. Martin Luther turns Europe upside down with his Protestant Reformation. 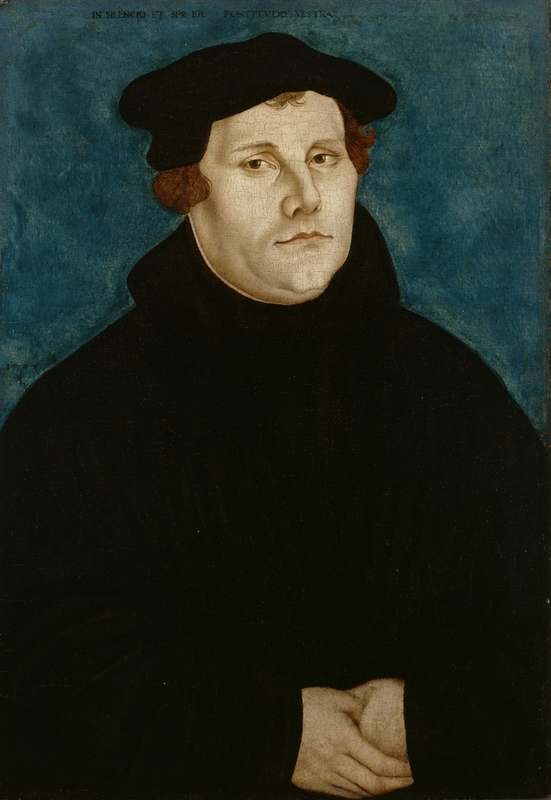 He lights the fuse in October 1517 by publishing a list of 95 theses critical of the church. He reportedly nails a copy to the door of the church in Wittenberg. He quickly becomes Europe’s most published author, according to some estimates selling more than 300,000 copies between 1517 and 1520. In 1521, Luther is excommunicated by Pope Leo X. The same year, the emperor Charles V issues the ‘Law of Printing’, banning the printing, sale, possession, reading and copying of Luther’s books anywhere in the Holy Roman Empire. The reformation spirals out of control. In the early 1520s, Hyldrich Zwingli starts his own Reformation in Zürich. In 1524, the Peasants’ Revolt breaks out killing an estimated 100,000. In the 1530s, Henry VIII separates England from the Catholic Church, and Christian III of Denmark declares Denmark and Norway Lutheran states.